All of these processes occur via the same mechanism, but you will need to know what reagents and solvents are required for each reaction. Halogenation, (for the purposes of this example, bromination) will not occur if benzene and Br2 are mixed together, the reaction requires the presence of a Lewis acid. FeCl3 or AlCl3 are used for chlorinations, and they follow the same procedure. 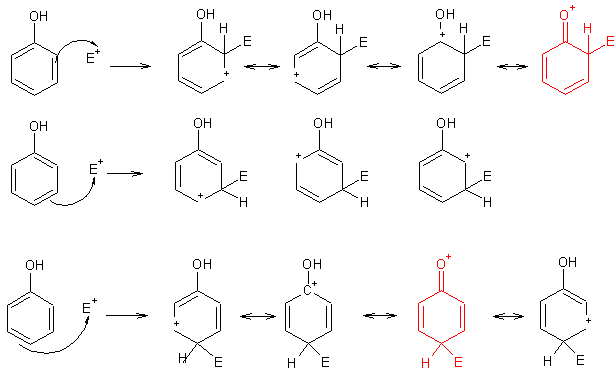 Fluorination of benzene is difficult as fluorine reacts rapidly with benzene and requires special equipment and an indirect method of reaction. You don’t need to know that reaction mechanism. Iodine is very unreactive towards benzene and so reaction has to take place in the presence of an oxidising agent, such as nitric acid. 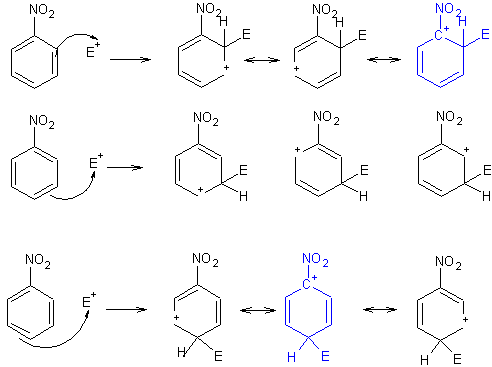 Nitration of benzene can occur by mixing hot nitric acid with benzene, but the reaction is very slow. It can be sped up by adding sulphuric acid, which increases the concentration of the electrophile, (NO2+). Sulphonation of benzene requires “fuming sulphuric acid”, which is sulphuric acid with extra SO3 added. The sulphuric acid produces even more SO3, which is the electrophile in this reaction. Friedel-Crafts alkylations, (named after the chemists who discovered this method, Charles Friedel and James Crafts) are valuable reactions as they form a carbon-carbon bond – a very important thing in organic syntheses. The first step in connecting an alkyl group to a benzene ring is forming a carbocation, here achieved by reacting an alkyl chloride with AlCl3. The reaction then proceeds as normal. If the R-X is a primary alkyl chloride, (meaning that it will form an unstable primary carbocation when the chloride is removed) the AlCl3 will instead form a complex with the alkyl group, which behaves as if it were a carbocation. Friedel-Crafts acylation is much the same as an alkylation, requiring an acid chloride and Lewis acid to react, although it will also react with acetic anhydride, (remember back to first semester and the preparation of paracetamol). Benzene’s reactivity is can be affected by any substituents attached, and this will determine the site of attack if any more substituents are added. If a substituent makes the benzene more reactive, it is referred to as an activating group, and it if makes it less reactive, a deactivating group. So far, so good. Electron withdrawing groups will deactivate the benzene and generally have a partial or full positive charge adjacent to the ring or electonegative atoms to remove electron density from the benzene ring. Activating groups are orth-para directing, as any additional substituents will be directed to the ortho or para positions due to the resonance effect of the electron donating group, which can form a relatively stable fourth resonance form. Deactivating groups are meta-directing, as ortho/para substituents lead to unstable resonance forms with the positive charge on the ring directly next to the partial or full positive charge on the substituent. The exception to this rule are the halogens, despite being electron withdrawing due to strong electronegativity, they still have lone pairs, which can be donated into the ring, making them ortho/para directing.